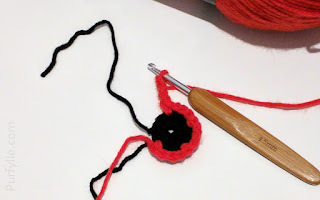 Secondly, to keep eyestrain to a minimum when working with black yarn. 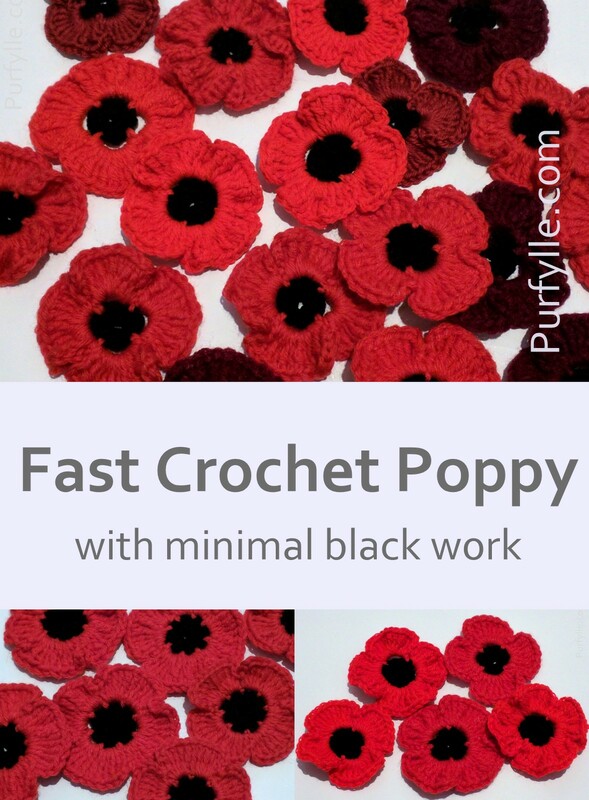 Here is my Fast Crochet Poppy Pattern and Fast Crochet Poppy With Minimal Stitches Worked in Black Pattern. 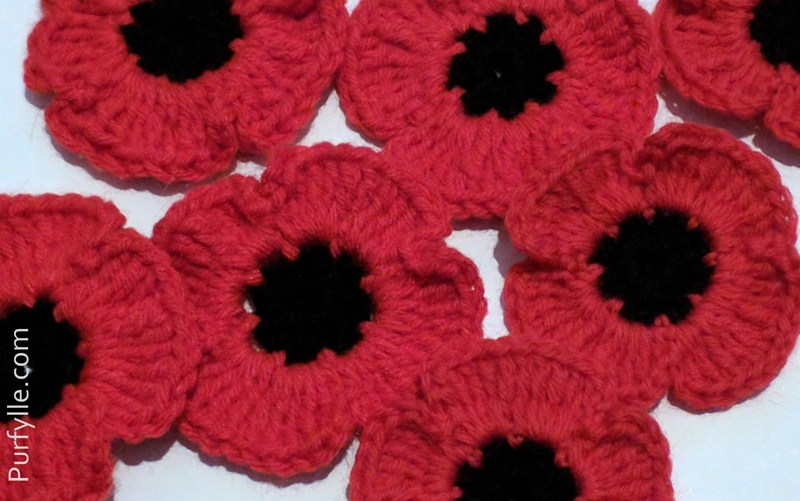 Crochet Instructions are given in US and Australian (UK) terms. These patterns work up equally beautifully using 10 ply / Aran or 8 ply / Double Knitting weight yarns. I used my 4.5mm bamboo handled hook with both yarns, these hooks have become my go to hooks. () - When stitches are inside parenthesis () they are all to be worked into the same space or stitch. Join red yarn with a *SC, Ch 1 skip a stitch of previous row, repeat from * to end. Join with a SS into first SC of row. Working into Ch 1 space work (SC, Ch 3, 5 TR), in next chain space (5 TR, Ch 2, HDC) first petal is complete, ** in next space (HDC, Ch 2, 5TR), in next chain space (5 TR, Ch2, HDC) second petal is complete. Repeat from ** for next two petals. SS into SC at start of row to finish. Using a DC, join yarn anywhere into the HTC stitches of row 2. *Ch 1, skip a stitch of previous row and DC into next stitch. Repeat * to end. Join with a SS to first DC of row. Working into Ch 1 space work (DC, Ch 3, 5 TTR), in next chain space (5 TTR, Ch 2, HTR) first petal is complete, **in next space (HTR, Ch 2, 5 TTR), in next chain space (5 TTR, Ch 2, HTR) second petal is complete. Repeat from ** for next two petals. SS into DC at start of row to finish. Ch 4, join with a SS into a loop (or use a magic loop or other loop method as preferred). Ch1, HDC 12 into ring, join with SS. Using a SC, join yarn anywhere into the HDC stitches of row 2. Ch 3, skip two stitches of previous row, *SC in next stitch, Ch 3, repeat from * two more times, SS to first SC of row. TIP: If the previous rows stitches are a challenge to see when counting stitches, position your SC at 9, 6, 3 and 12 O'clock. Working into Ch 3 space (SC, Ch 2, 12 TR, Ch 1, HDC), first petal complete, ** in next chain space (HDC, Ch 1, 12 TR, Ch 1, HDC) second petal complete. Repeat from ** two more times, SS to finish. Tip: you can work anywhere between 8 - 14 trebles for each petal depending on yarn weight and personal preference for how much rippling you want each petal to have. Using a DC, join yarn anywhere into the HTC stitches of row 2. Ch 3 skip two stitches of previous row, *DC in next stitch, Ch 3, repeat from * two more times, SS to first DC of row. Working into Ch 3 space (DC, Ch 2, 12 TTR, Ch 1, HTR) first petal complete, **in next chain space (HTR, Ch 1, 12 TTR, Ch 1, HTR) second petal complete. Repeat from ** two more times, SS to finish. Wonderful! 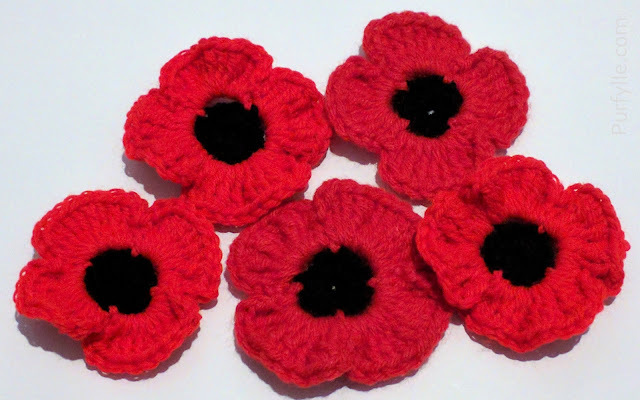 What are the poppies going to be used for? 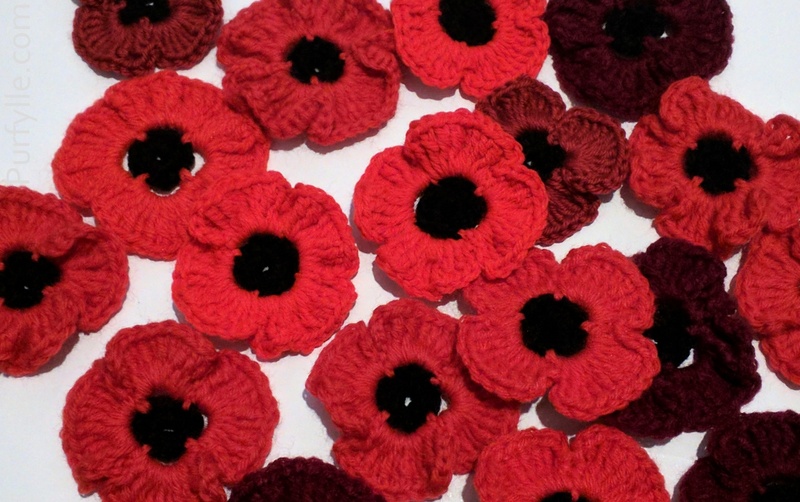 This pattern and the proud poppy pattern were both used in a large installation of 64000 poppies at Kings Park in Perth along with many other patterns too. 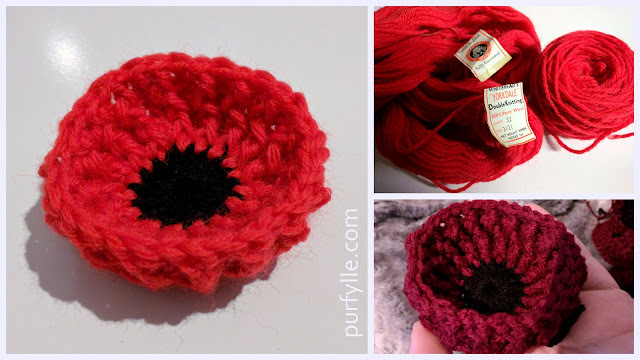 This pattern is excellent for attaching to backing sheets or to make garlands, the proud poppy one will stand up on a florist stem even if it rains. Good luck with your project!